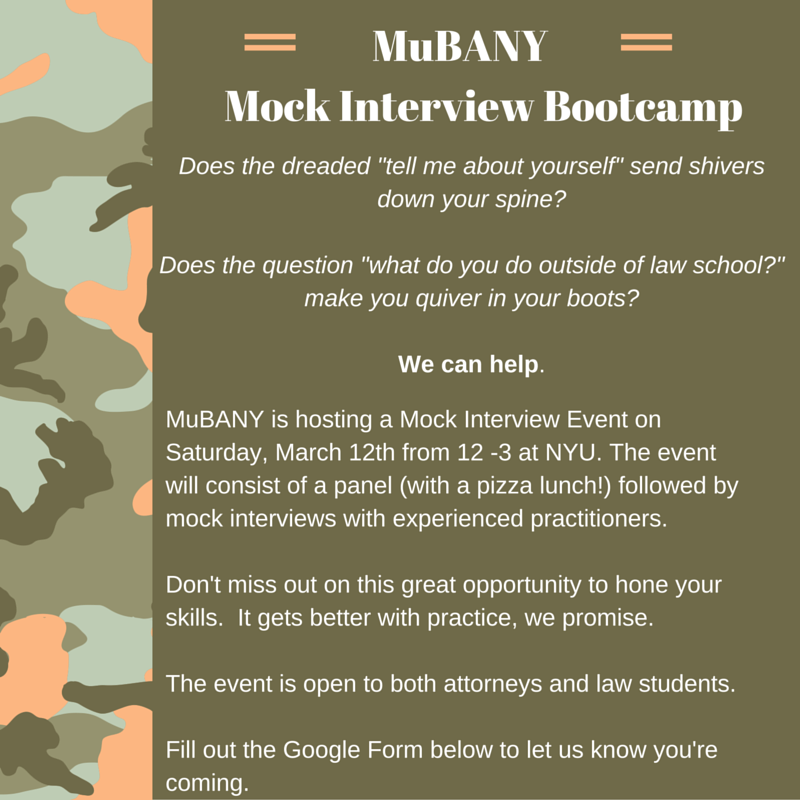 The Muslim Bar Association of New York (MuBANY) will be hosting a Mock Interview event at NYU on Saturday, March 12 for both law students and attorneys. If you are interested or have any questions please feel to email Saira Hussain at saira.f.hussain@gmail.com. DRI announces its annual Law Student Diversity Scholarship program, open to rising (2016-17) second- and third-year African American, Hispanic, Asian, Native American, LGBT and Multi-Racial students. The goal of these scholarships is to provide financial assistance to two worthy law students from ABA-accredited law schools to promote in a tangible way, the DRI Diversity Statement of Principle. All rising second- and third-year female law students are also eligible, regardless of race or ethnicity. Any other rising second- and third-year law students who come from backgrounds that would add to the cause of diversity, regardless of race or gender, are eligible to apply. To qualify for this scholarship, a candidate must be a full-time student. Evening students also qualify for consideration if they have completed one-third or more of the total credit hours required for a degree by the applicant's law school. Applications must be received by DRI no later than Wednesday, March 30, 2016. The 2016 Law Student Diversity Scholarship winners will be notified in advance and will be officially announced at theDiversity for Success Seminar, June 9-10 at the Fairmont Hotel in Chicago, Illinois. Seminar brochure and link to register to follow. The LaLSA Moot Court offers first-year law students the opportunity to develop brief-writing and oral advocacy skills. The winners of the LaLSA Moot Court Internal Competition will represent Columbia Law School at this year's UC Davis Asylum & Refugee Law National Moot Court Competition. Throughout the fall semester, our 1Ls have enthusiastically participated in a series of workshops designed to develop their oral argument skills. The LaLSA Internal Competition will help determine which 1Ls will represent Columbia Law School nationally. More importantly, it will also mark the culmination of our 1L's efforts throughout the most challenging year of their law school experience. For most, it will be the only time during their 1L year when they receive substantive feedback from a legal practitioner. Your participation will ensure that the Internal Competition is a challenging and rewarding experience for our 1Ls. You are invited to sign up to judge the Internal Competition for 1-hour rounds. One hour of CLE credit may be earned for each 50 minutes of participation. Only six credit hours can be earned for participation during each reporting cycle (two years). Credit will be applied towards the category of “Areas of Professional Practice.” Credit hours are not available for the attorneys’ own preparation time. You will be required to sign a CLE sign-in and sign-out sheet, which we will provide. The Competition will take place on the evenings of January 19th and 20th at Columbia Law School. When you sign up to judge, you will receive further information about the problem and the competition. Please contact Rebekah Rodriguez at rmr2176@columbia.edu to sign up to serve as a judge or if you have any questions. — at Dorsey & Whitney, LLP. October 27th through the 29th in return for pro bono service in the Court’s Access to Justice Program. Program will be held at 111 Centre Street, Room 107. Buy your tickets for the 2015 Gala! HNBA Latina Commission is now accepting nominations for its Annual Award. The HNBA Latina Commission is accepting nominations for its Annual Award in honor of Latina trailblazers who, licensed a minimum of 20 years, have achieved great distinction by opening up opportunities historically closed to Latina lawyers. The purpose of the Latina Commission Award is to honor the legacy left by the earliest Latina lawyers, first documented in 1996 at the HNBA’s Annual Convention in San Francisco. That year, the HNBA premiered Las Primeras, a visual history of 21 of the first Latinas licensed in the United States. With the creation of the Latina Commission in 2008, an annual award was established to continue the tradition of recognizing and honoring trailblazing Latina lawyers, affectionately known as Primeras, for their unique contributions to the legal profession. Each year, this award will honor outstanding Latina lawyers nominated by the membership. The Latina has influenced other Latinas to pursue legal careers. The Latina has opened doors for Latina lawyers in a variety of job settings historically closed to them. The Latina has advanced opportunities for Latinas within a practice area or segment of the profession. The Latina has made significant contributions to the legal profession. The Latina has made significant contributions to the Latino community as a direct result of her legal work. Nominees may be HNBA members or nonmembers. Nomination Form– Complete and submit the online nomination form. Nominee’s Resume– Include the nominee’s resume or biography, describing her background and contributions. examples for one of the two mandatory criterion and at least one of the additional criteria detailed above. more than five letters of support from individuals or organizations. If more than five letters are submitted, Commission staff will determine which letters will be included with the final nomination packet under consideration by Commission members. The nomination form and your supporting materials constitute the sole basis for the nomination. Materials will not be returned. The limitation on letters of support will be observed. If more than five letters are submitted, Commission staff will determine which letters will be included with the final nomination packet under consideration by Commission members. Nominations can be submitted via email to Maria Gonzalez Knavel at mgonzalezknavel@gmail.com or to Erica Mason at emason@constangy.com. Include in subject line “2015 LATINA COMMISSION AWARD NOMINATION.” Articles can be submitted via live URL links or PDF files. Current Commission members or liaisons are not eligible for the Award for the duration of their terms and for three years following service. Each year, the DBA awards individual scholarships to eligible law students who demonstrate community involvement, academic promise and financial need. Rising 1L's, 2L's, 3L's and 4LE's matriculated in an ABA accredited law school may apply to receive a $3,000 scholarship. Scholarships to be awarded at our 12th Annual Scholarship Gala on 9/28/2015. Scholarship application can be requested by emailing dominicanbarassoc@gmail.com. Please allow 2-3 business days for the application be emailed. All applications to be considered must be received by Wednesday, August 12, 2015. If you are graduating this June, and going to a CUNY Community College, you can qualify for a scholarship offering you $850 cash! Payments of $400 as you complete the requirements for a 5-week summer prep program and join first semester activities at a CUNY college. A Grace Outreach college counselor will guide/support you in your first year at a CUNY college, and you will obtain membership in a great peer program. Training will be provided this summer (prep program) to improve your Math, Reading and Writing skills in order to master the CUNY Skills ACT/COMPASS Placement Tests. You must apply to a CUNY College or will apply within the first week of the program. Grace Outreach is awarding a total of $850 in cash to 18 students and 20 hours a week of college prep with a total payment of $400 by the end of the summer. Additional payments when you meet your first semester college goals. A monthly Metro card for the summer program is provided.